This recipe is freaking delicious!! Try it, you’ll love it… and so will the lucky people who get to enjoy it with you. 1 ½ tsp orange oil (found in special food stores)–or you could try 1 Tbs orange juice and cut the milk to 1 ½ Tbs. However, I prefer the pure orange oil. In a mixing bowl, combine flour and next five ingredients (flour through salt). In a small bowl, combine coconut milk, oil, eggs, vanilla, and orange juice and rind. Slowly add to dry ingredients and mix on medium speed until smooth. 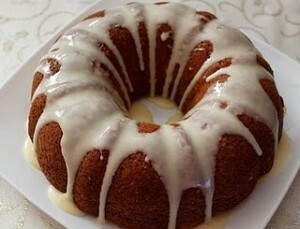 Pour into prepared bundt pan. Bake 35 to 40 minutes, until a toothpick inserted in the center comes out clean. Let cool completely before removing from pan. If you don’t, it might break! The chocolate chips will settle at the bottom, which becomes the top of the cake when you put the cake on a plate. With a knife, add glaze to completely cooled cake, letting it run down the sides . Here in the U.S., it’s blackberry season. In the Pacific Northwest, where I live, blackberries are everywhere. I pick them and freeze, so that we have blackberries all winter long. Freezing is so easy! Just pick, spread on a cookie sheet and freeze for several hours. Then pour into a freezer container. 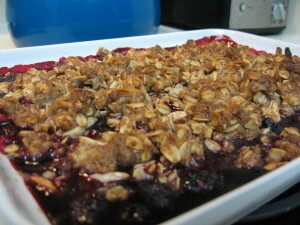 One of my favorite recipes is a cobbler I call Blackberry Good Stuff. Once you try it, you’ll be hooked. This recipe calls for an 8 x 8 inch pan, but I like to make more than that… my family demands it! 🙂 If you want to make a bigger batch, double the crust recipe and use a 9 x 13 inch pan. Cut in 1/2 cup soft butter until crumbly. Pour berries evenly over partially-baked crust. Sprinkle the remainder of the crust over the berries. Bake 45 minutes. To die for! Great warm or cold, served plain or with vanilla ice cream.